POLICE SEEK PUBLIC’S HELP IN SOLVING COUNTRY’S LATEST HOMICIDE. Nassau, Bahamas - Police on the Island of New Providence are investigating a shooting incident, which has left a male dead and a female with injuries. According to reports, shortly after 10:00pm, Thursday, 9th August, 2018, a group of persons were playing a board game in front of a home on Taylor Drive off Victoria Boulevard, Bamboo Town, when a white vehicle drove up; the occupants opened fire in the direction of the people, injuring two of them before speeding away. Emergency Medical Service Personnel were called to the scene and attempted to revive the male victim, but were unsuccessful. He was pronounced dead on scene. The female victim was transported to hospital and is listed in stable condition. Police are asking members of the public, to come forth with any information they may have in solving an armed robbery, which occurred Thursday, 9th August, 2018. According to reports, shortly after 3:00pm, a female had just exit her red Honda CRV Jeep in the parking lot of a business establishment on Wulff Road near to Marathon Road, when she was approached by a male armed with a firearm who robbed her of her handbag, which contained cash and other items, before getting into her jeep and driving away. The vehicle was recovered a short time later, in the area of a church on St. James Road. In the first incident, according to reports, shortly after 7:00am, 9th August, 2018, Mobile Division officers responded to a disturbance call at Young Close off Market Street. Officers spoke with a male who reported that he was attacked by three men, one armed with a firearm. He was able to disarm the gunman and he and the others ran. He turned over to police a .380 Pistol. A short time later, police took three men into custody in connection with this matter. 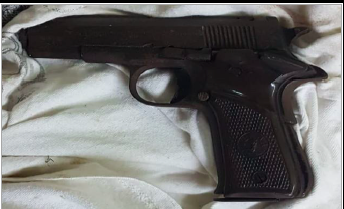 In a second incident, according to reports, shortly after 3:00pm, Southcentral Division Officers, acting on information, went to an abandon building on St. Vincent Road and Emmanuel Way and recovered a 9 millimeter pistol with 3 rounds of ammunition. No arrest was made in this matter.